I love this pattern and I so love this yarn! ^^ At the beginning it was somehow strange to knit with a yarn as thin as that but then I got used to it and the shawl went on very quickly. The diagram is very easy to memorize (you follow the pattern on the right sides and knit all stitches on the wrong sides) and the pattern really shows the delicacy of KS Haze. 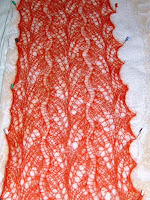 BTW, for the beginners in lace knitting, I recommend Julie's post on blocking lace.